Roll of 10 40mm briquette. Holland-made Three Kings is the leading premium brand that is internationally recognized in the incense world for its consistent quality level and dependability. 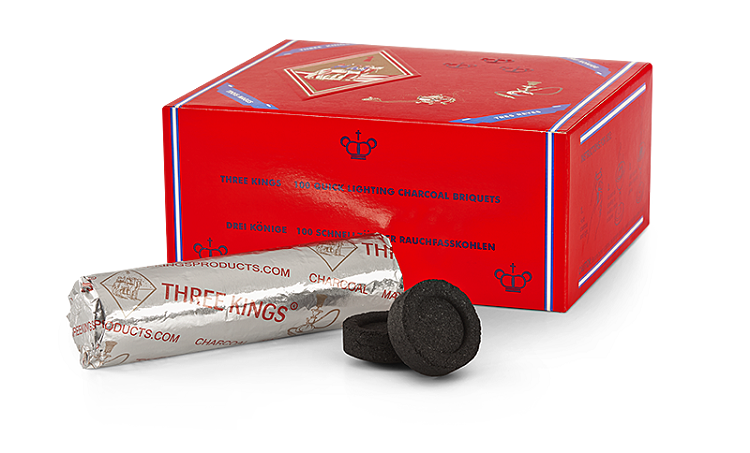 Three Kings Charcoal briquettes have been made in Holland by René Schönefeld Incense and Charcoal Manufacturing since 1936. 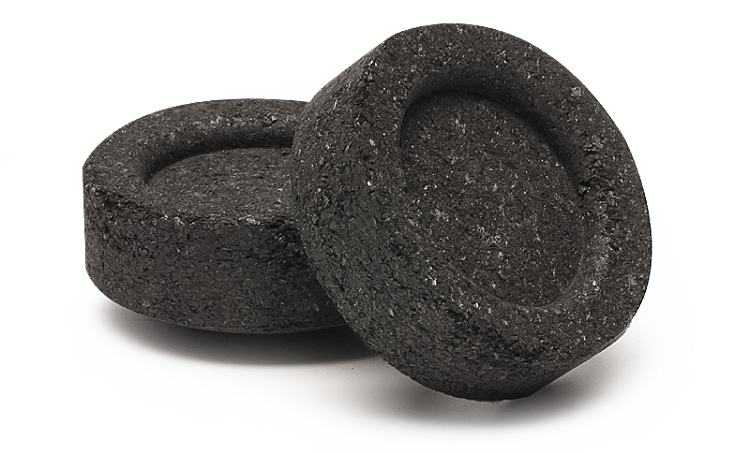 Using only the best ingredients combined with the almost 80-year old production techniques, Three Kings charcoal briquettes ignite easily, are odorless and have a smooth, long and even burn. Three Kings charcoal is internationally recognized for its consistent quality and dependability. Three Kings Charcoal is available as quick lighting charcoal briquettes. Each briquette ignites easily and quickly by holding a simple, small-flamed lighter to it. Due to the strict selection method and high quality demands of the raw material, as well as the 50-year old, perfected production techniques these briquettes hold no flavor of their own, and have a smooth, long and even burn. Three Kings Charcoal has since it was first produced been used for burning bakhoor and incense. Three Kings charcoals are internationally recognized as the best quick lighting charcoal available on the market. 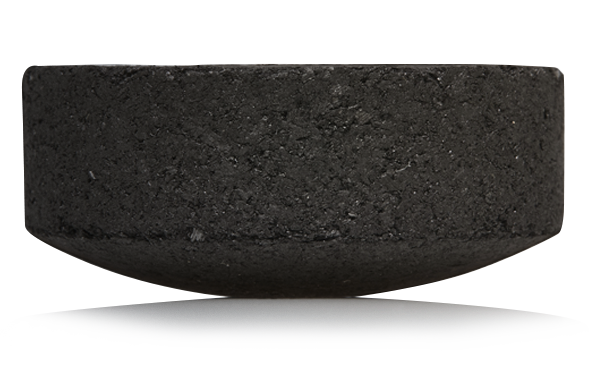 The disc-shaped briquettes are available in two sizes- 33mm and 40mm. CAUTION: Ensure burner is placed and remains on a heat resistant surface when in use. Keep out of reach of children and pets. Al-Rashad carries genuine Swift-Lite charcoals. Please use these charcoals to only burn incenseâ€”smoking shisha/hukkah etc. is harmful to your health and is markooh (discouraged) or haram (forbidden) in Islam. Swift Lite International Ltd is the original Swift Lite charcoal manufacturer in the UK with production facilities since 1957. Swift Lite Charcoal tablets are also still widely used for incense burning for religious and recreational use. Swift-Lite sources all their charcoal from fruit trees, specially the apple tree. This makes the finest quality charcoal powder. Beware of counterfeitsâ€” Genuine Swift-Lite is smokelessâ€”inhaling smoke from counterfeit and low quality charcoal can be harmful to your health. CONTENTS: This box contains 100 Swift-Lite Charcoal tablets for incense burning. The tablets are packed in rolls of 10 and are sealed in an airtight pack in order to maintain efficient combustion. In order to maintain freshness, open rolls should be re-sealed and returned to the box which should be kept closed and stored in a cool dry place. Effective storage will ensure quick lighting and long burning. TO USE: Remove a tablet from the sealed roll and place in a censer or a heat-proof dish. Light the edge of the tablet with a match or taper. The tablet will then light across its surface. The tablet should be left to burn out and cool in the censer. If the tablet is to be extinguished before it is fully cooled then it should be placed in a container of cold water. WARNING: When the tablet has been lit, do not handle it as it will cause a burn. Do not dispose of the ash remains in a waste paper bin as this may cause a fire. Do not hold the tablet in your hand when lighting or when burning. CAUTION: This product lights instantly.